: Scent hound used for hunting hare and fox. It is not a pack hound and not used for hunting deer. : A great variety of scent hounds existed in the county of Småland during the 19Th century. Some, whose ancestry came from German, Polish and Baltic hounds, had accompanied soldiers returning to Småland from the great wars (1611-1718). Those hounds together with local farm dogs of spitz type with an addition of English hounds became the foundation of the Smålandsstövare. Size as well as colour varied, as did the length of tail. Some where black-and-tan, others red or yellow. White markings were common. Some dogs were born with short tails. In the early 20Th century great efforts were made to re-establish the old Smålandsstövare, mainly the bobtailed variety, although the first standard drawn in 1921 allowed both the natural short and long tail. 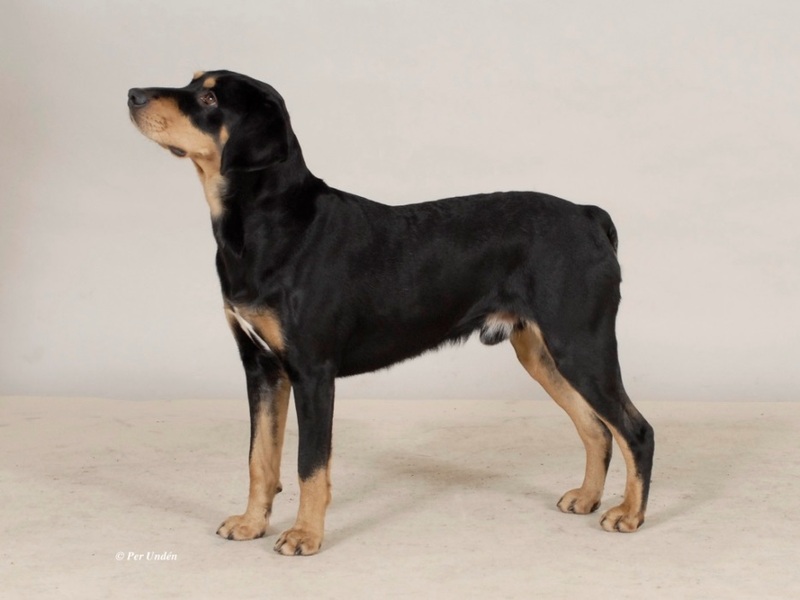 Colour was primarily decided to be black-and-tan but red and yellow was allowed as was white markings. The Smålandsstövare has had continuing additions of new blood, sometimes with strong lines to other breeds. The last time new blood was added was in the 1950’s, when for a short period, dogs of accepted type but with unknown background where registered as Smålandsstövare. : Robust dog with a somewhat elegant look. It should be strong but not heavy in built. Coat should be harsh. : Almost square in body. Depth of body should be nearly equal to half of the height at withers. : Calm, kind dog with a faithful and keen temperament. : Lean and of medium length. Broadest between the ears. : Stop well defined, distance from occiput to stop should be equal to that from stop to tip of nose. : Nose black, with large nostrils. : Muzzle well developed, neither coarse nor snipy. Bridge of nose straight and parallel to line of skull. : Upper lips only slightly overhanging. : Set fairly high and slightly raised when the dog is attentive. Slightly shorter than the distance from base of ear to half-way along muzzle. Hanging flat and tips rounded. : Moderately long, powerful without being coarse, merging beautifully into shoulders. Skin on neck supple and close fitting. : Back short and powerful. : Chest well developed with well sprung ribs. : Either long and set on in a straight line with the back. Straight or slightly curved in sabre fashion. Barely reaching hocks. Half length tails also permissible. When the dog moves, tail preferably not carried above the level of the back. : When viewed from front forelegs appear straight and parallel. Strong bone in harmony with the general appearance of the dog. : Upper arm long and forming a right angle to shoulders. : Firm with well knuckled and tight toes. : Muscles well developed and thighs broad when viewed from side. : Parallel, strong and long-reaching. : Medium length, harsh, close fitting coat that is coarser on back and neck. Undercoat short, dense and soft. On head, ears and front of legs coat should be short and smooth coach. Under the tail and back of thighs top coat longer than on the back. Coat well developed between toes and pads. : Black-and-tan. Tan, any shade from amber to a warm auburn. Small white markings permissible on chest and toes. Males 46-54 cm, Ideal size 50 cm. Females 42-52 cm, Ideal size 46 cm. Lack of tan-markings ; black pencilling in the tan.